Make sure that Addappter supports the device you want to connect. 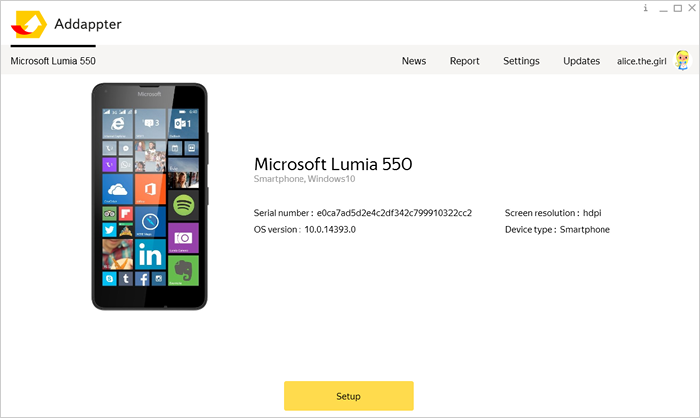 Create a Microsoft account (for Windows Phone). Turn on the developer mode on the device (for Windows 10 Mobile). Tap the notification bar and slide it down. Tap All parameters → System → About the system. The Windows version is displayed in the About the device section. Tap All settings and choose About the device in the System section. The Windows version is displayed in the phone information group. Note. You only need to create a Microsoft account for Windows Phone devices. Skip this step if you are connecting a Windows 10 Mobile device. To register, you will need an email (for example, at live.com). If you use the customer's email, you may be required to confirm it. For more information about creating an account, see Microsoft help. Note. You only need to turn on the developer mode for Windows 10 Mobile devices. Skip this step if you are connecting a Windows Phone device. Tap All parameters → Updates and Security → For developers. In the Use developer features section, turn on the Developer mode option. Start Addappter and connect the device to the computer using the USB cable. Unlock the device if it is locked, and wait for the device to be connected (this usually takes 5–10 seconds). Addappter displays information about the connected device. When the device is connected, you can install applications.